Margaret Maron reads from her work on campus at UNCG. Just in time for Halloween, the season of fright, homegrown mystery maven Margaret Maron heads to UNCG to introduce audiences to another successful woman mystery writer. The inaugural installment of what may become a series, “Margaret Maron Presents Women of Mystery,” features writer Nancy Pickard. The program, free and open to the public, begins at 7 p.m. Wednesday, Oct. 29, in the Virginia Dare Room of the UNCG Alumni House. 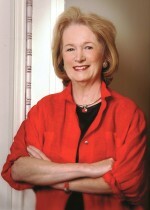 Mystery maven Margaret Maron spotlights fellow woman of mystery Nancy Pickard Oct. 29 at UNCG. Maron, a Johnston County native, lists numerous accomplishments and awards that include an honorary Doctor of Letters degree from UNCG in 2010. She attended Woman’s College, now UNCG, from 1956-58. She planned to study education but switched her major to English after one class. She left after her sophomore year and took a summer job at the Pentagon, where she met her husband. For the first in what will hopefully become a yearly fall series, Maron chose to invite her friend, colleague and fellow author Nancy Pickard. Pickard, a Missouri native who lives in Kansas, is a successful author in her own right. Like Maron, Pickard is a founding member and former president of Sisters In Crime, the international organization dedicated to the advancement of women mystery writers, and she is a former national board member of the Mystery Writers of America. As for writing murder mysteries, Pickard says she owes it all to Nancy Drew. “Margaret Maron Presents Women of Mystery” is sponsored by the UNCG University Libraries.